Uglyworld #1171 - Puzzled, a photo by www.bazpics.com on Flickr. Babo wasn't too amused that I have to work through the weekend, and even moreso Independence Day tomorrow. Thankfully I managed to get most of the work needing done today wiped out by mid-morning (not even going to tell you what time I got out of bed to do so! 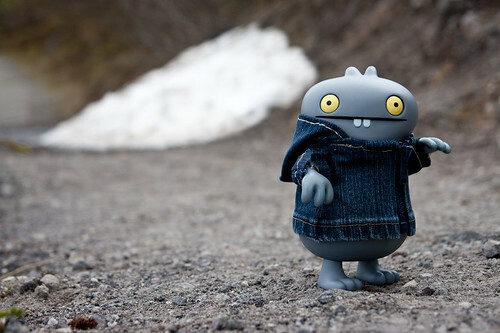 ), so I gave Babo a heads up to put his jacket on and meet me in the hotel carpark for another magical mystery tour. The car drive took us just over 2 hours to do, and for that entire time I made Babo cover his eyes to make the trip even more fun as he wouldn't have any idea where we were when he got out of the car. Once I had parked the car up I helped Babo out of the car (with his eyes still covered) and then told him to open them. Look at the surprise written all over his face, he was so puzzled as to how there was a huge pile of snow behind him and we were having a scorching July day.